"For faithful members of the Church of Jesus Christ, the companionship of the Holy Spirit should be so familiar that we must use care not to take it for granted. For example, that good feeling you have felt during the messages and music of this conference is a confirming witness of the Spirit, available to faithful members on a continuing basis. A member once asked me why he felt so good about the talks and music in a sacrament meeting, while a guest he had invited that day apparently experienced no such feeling. This is but one illustration of the contrast between one who has the gift of the Holy Ghost and is in tune with his promptings and one who has not, or is not. "If we are practicing our faith and seeking the companionship of the Holy Spirit, His presence can be felt in our hearts and in our homes. 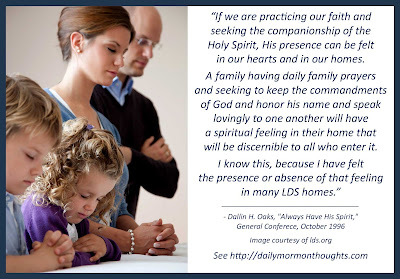 A family having daily family prayers and seeking to keep the commandments of God and honor his name and speak lovingly to one another will have a spiritual feeling in their home that will be discernible to all who enter it. 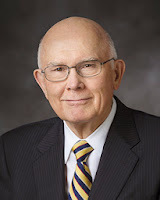 I know this, because I have felt the presence or absence of that feeling in many LDS homes." Can we begin to take for granted the blessing of the Holy Spirit in our lives? If we truly recognize and treasure the ways that gift influences us, we must never get casual about it but always respond quickly and gratefully to its promptings and blessings. We should actively seek those influences regularly and frequently in our lives! There are certainly things we do in our personal lives, and in our family settings, that can encourage or discourage the presence of the Holy Spirit. A careful investigation of factors that might fit in those two categories would be very beneficial. President Oaks suggests that a family's efforts to invite the Holy Spirit into the home can have a profound, and noticeable, effect. Prayer, obedience, kindness to one another—simple, but powerful, actions that make all the difference.